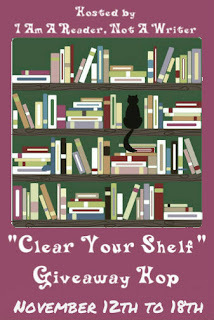 Welcome to my stop on the Clear Your Shelf Giveaway Hop hosted by the mindblowingly awesome Kathy at I Am A Reader, Not A Writer. As I said in the Thankful For Books Giveaway Hop, my bookshelves are overflowing and I need to thin it down a little. I'm going load up a box of books - it'll be a mixture of adult and YA - to send to the winner. I have probably three 2 1/2 foot tall piles of books that I no longer want, and whatever the winner says their favorite genre is will make up the majority of books in that box. Thank you for the giveaway, especially since Canadians can enter! So many of them are US only. I saw that you have lots of books you want to get rid of, so I'd recommend checking it out if you want to give the ones not in this giveaway to a good cause. Thank you for the opportunity to win! Thanks so much for giveaway! I love mystery box. Not a bad thing going on here :) Keep up the good work! Thanks for the GREAT giveaway and have a great fall! Thanks so much for the giveaway. I really like surprises. I love suspense and cozy mysteries. I usually donate my used Y/A books to the school library. Wow such an awesome giveaway! Thanks for the chance!